“Woahmen chi ba,” Luke Williams says over dim sum. It translates to “Let’s eat”—it’s the only Mandarin phrase the multi-instrumentalist in Matteo, a Chinese-American hybrid folk band, knows. Red Maple Chinese Cuisine employees meander around the dining room Saturday morning with pushcarts filled with stacked steamer baskets of dim sum—the Cantonese version of a small-plates dining experience. There are Hong Kong-inspired delights, like cheung fun (shrimp balls wrapped in rice noodles) and char siu bao (white pastries filled with barbecued pork) and also spicy dumplings from Sichuan—a western province of China, where Matteo will be the artists-in residence at Sichuan University in June. Luckily for Williams, the other three members speak fluent Mandarin. For him, there’s always the language of music. In Sichuan, they plan to record an EP with six new tunes and additional live tracks—all written and recorded there—and accompanying music videos. 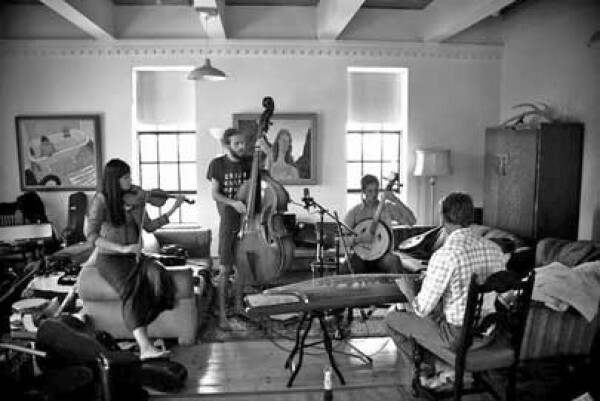 The Salt Lake City quintet draws upon traditional Western stringed instruments for their sound but distinguish themselves with the use of a slew of Chinese ones, as on The Morning Market, their lush, harmonious debut album. Chinese culture has a prominent role in their lives. Bandleader Eric Chipman works at the Confucius Institute at the University of Utah, and Brinn Bagley Chipman teaches Chinese at an elementary school. The Chipmans and J. Daniel Young served LDS missions in Taiwan, where they all became enamored with and purchased their instruments. “We loved the instruments and their sounds, but we didn’t always like the traditional music, nor did we feel that we could be authentic because we’re not Chinese,” Bagley Chipman says. Classical contemporary Chinese music is arrhythmic music—“You can’t tap your foot to it,” Chipman says—like composer Tan Dun’s work in Hero, it’s generally sparse and meditative. “We have always wanted to be a little closer musically to what’s familiar,” Bagley Chipman says. But it’s not like drowning dim sum in ketchup, because the ingredients essentially dictate the recipe. “You can’t physically make music like you’re used to making. There are all these limitations that we have to work through,” Chipman says. When Matteo heads to Sichuan, they’re leaving behind the Western instruments. “The scales will be tipped to more Chinese-sounding material than American,” Williams says. The bandmates say they’re not proficient with their 6-foot-long zither (a string instrument), erhu (Chinese violin) or raun (Chinese banjo). “We can listen to the instruments and play them, but it’s not like we’ve had someone sit down and tell us it’s not the right tone or how to get it,” Chipman says. So, in Sichuan, they’ll take music lessons in these traditional instruments and a few more—liuqin (mandolin) and a mouth organ. These are lessons they can’t acquire in Utah, Bagley Chipman says. Chipman says that in Zen drumming, for instance, the first training is to carry around a bag of rough rocks—until they are smooth, you’re not ready. “It’s such an Asian thing to not do anything fast. [Any art] is more than you,” Bagley Chipman says. Although 30 days wouldn’t “get the rocks smooth,” it will offer a boost. “We want to do it a little more justice, because they are amazing instruments, and we are, kind of, just hacks,” Young says with a laugh. Then, “Amazing Grace” played on a Chinese flute comes over the speakers. “This is so appropriate,” Young says. Over the month, they’ll document the experience with the EP, as well as videos, which they want to mirror the Chinese artistic aesthetic that is largely concerned with negative space and where people are small and nature is huge. Matteo selected production company Tiger in a Jar to come along, and the band is trying to raise $6,000 via Kickstarter.com to make the project a success.